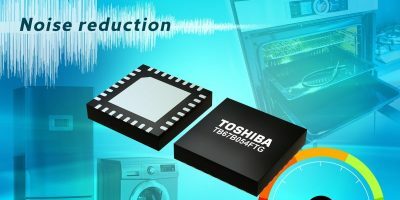 Designed for switching multi-pole motors, the TB67B054FTG is a new three-phase brushless fan motor controller IC for white good that realizes a high efficiency drive and noise reduction, says Toshiba Electronics Europe. 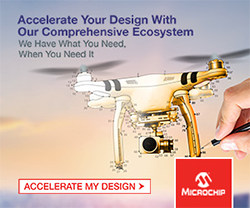 Conventionally, motor control is carried out by a microcontroller and an eight-pole rotor using a rotation-control signal that delivers three pulses per cycle. The TB67B054FTG can control the rotation speed of a 12-pole rotor with a standard microcontroller system by using a rotation-control signal that delivers two pulses in a single cycle. Switching from an eight-pole to 12-pole rotor achieves higher drive efficiency and reduces system noise. However, rotation control for an eight-pole rotor can also be implemented, shortening the development cycle, points out Toshiba. 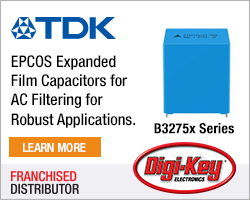 The controller is housed in a small, surface-mount 32-pin QFN type package, which has a 68 per cent smaller mounting area (5.0 x 5.0mm) than the widely used 30-pin SSOP, saving PCB space and allowing use in densely-populated applications. Mass production for the TB67B054FTG has begun. Toshiba Electronics Europe is the European electronic components business of Toshiba Electronic Devices and Storage Corporation. TEE a variety of hard disk drive (HDD) products, semiconductors for automotive, industrial, IoT, motion control, telecoms, networking, consumer and white goods applications. 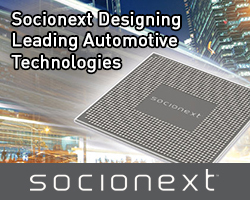 The company’s portfolio encompasses integrated wireless ICs, power semiconductors, microcontrollers, optical semiconductors, ASICs, ASSPs and discrete devices ranging from diodes to logic ICs.